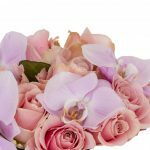 If you’re not green fingered, you can enjoy orchids in your home as part of our bouquets, you can shop our favourites right here. 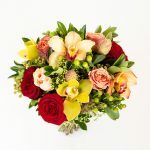 Cymbidium orchids are incredibly beautiful and decorative but are not as demanding as other orchid varieties and can be relatively easy to keep in your home. The flowers are long lasting and stick around through winter which is beneficial for our wellbeing during the colder months. Did you know keeping flowers in your home can help reduce stress, increase your mood and help your memory? 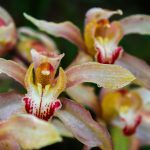 Cymbidium orchids differ from other orchid varieties due to the temperature they thrive in – which makes them the perfect addition to British homes! This orchid LOVES bright light. When you’re looking for a spot to keep it, make sure your orchid has access to natural light all year long, especially during the winter months when they flower. The trick is to remember to shade your little orchid from the midday sun during the summer. Especially if you choose to keep it in the garden! Yes, you read that correctly – you can keep cymbidium orchids outside if you wish. This variety adores cooler temperatures and thrives when it’s kept between 10-14 degrees. The plant can be kept outside, but you must get them used to their new home slowly or their leaves can be scorched by extreme cold or the sunlight. 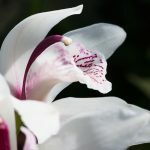 During flowering months, it’s advised to expose your orchid to temperature changes between night and day, throughout the winter, conservatories can make perfect homes for your plant. The winter months will require you to move your plants to a cool bright location to thrive. 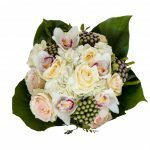 Cymbidium orchids typically flower from late summer lasting throughout the winter months. 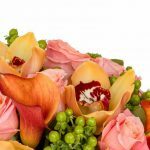 The success of the flowering can rely on a few things, such as fertilising through spring and summer and following temperature guidelines. You will need to support flowering stems as they grow, so it’s common practice to use support sticks like bamboo to sturdy stems, especially those with many heads. Cymbidium orchids usually flower for 6 to 8 weeks. When the flowers have finished, you will need to cut their stems down to the base to prepare them for next year. 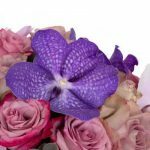 When it comes to keeping orchids, watering can be the difference between a thriving plant and a sad one. It’s better to ‘under’ water an orchid than it is to ‘over’ water one. When watering your cymbidium orchid, you need to follow these short rules to avoid flooding and causing more damage than good to your plant. If you plan on keeping your orchid outdoors, you can give them a helping hand by watering a little more often during the summer months and much less during wetter winter months. 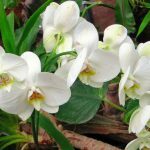 If you are new to keeping orchids, don’t worry at all. 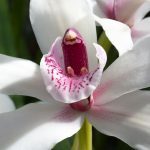 The cymbidium orchid is much more forgiving than other varieties and following these instructions should keep it flourishing throughout the year for you. We adore this orchid variety and hope you will to.